Streamlined in design with a contemporary styling, the Waverly Panel Low Profile Bed with storage is the perfect addition to your modern bedroom. 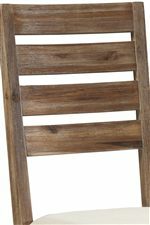 It features two solid Acacia floating panels with a wire brushed texture framed by four-inch canted Acacia posts for a relaxed, casual profile. Characterized by clean lines and a low profile design, it features a convenient storage rail with two drawers that can be used individually or in pairs. Easily tuck away linens, blankets, and other bedroom accessories with ease to keep your bedroom neat and tidy. A slat roll is provided so you can use this bed without a boxspring. 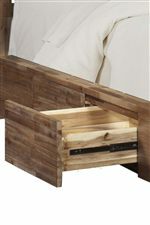 Open space at the bottom of the footboard and a rich Driftwood finish add a subtle detail to lighten the overall look. This bed is available in Queen and King sizes. The Waverly King Panel Low Profile Bed with 2 Storage Drawers by Cresent Fine Furniture at AHFA in the area. Product availability may vary. Contact us for the most current availability on this product. 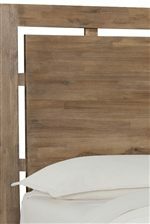 5531KRL King Panel Rail 1 88"
5531KB King Panel Headboard/Footboard 1 84" 50"
5531KRS King Storage Rail 1 88"
Finish A wire-brushed natural finish highlights the beauty of the Acacia wood. Handles & Hardware Minimalist bronze bar pull hardware keeps door- and drawer-fronts streamlined. 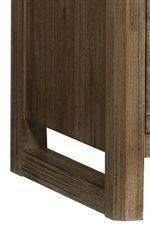 Case Detail A trestle table base, looped legs on the bench, raised case pieces that lend a light look overall, and canted corners offers the Waverly collection clean, yet soft lines. Drawer / Shelf Construction English dovetailed, solid wood drawers, which close over blind parting rails to keep the look clean and contemporary. Drawer Suspension Full extension, ball bearing, side mounted drawer guides allow you to utilize every inch of space in a drawer, front to back. Description: Top The trestle dining table features a slab tabletop. All pieces are solid wood. Case Construction The Waverly collection is crafted from solid Acacia wood - a native of South East Asia that is known for durability. Everything is mortise and tenon. 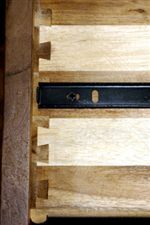 Everything is English dovetail - front and rear. Dust-proof throughout. Discover Waverly, a contemporary lifestyle furniture collection that is designed for those seeking well-made furniture with modern features at an affordable price. 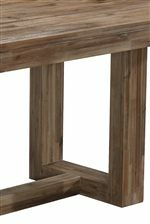 Crafted with plantation-grown solid Acacia with a wire brushed texture, each piece is finished in a rich Driftwood for a clean, natural look and feel for your home.. Expertly constructed with high quality joinery and wood manufacturing, each piece is custom-built to enhance daily living. Innovative modern conveniences include a built in power-port on back of nightstand for overnight charging, and whisper-close drawer slides for noise-less access. 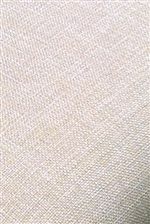 Felt lined top drawers and cedar lined bottom drawers protect your clothing, textiles, and jewelry against insects and odors. Minimalist bar pulls in a warm bronze finish add a clean, refined look. Including both dining and bedroom pieces, it is easy to bring a refreshingly contemporary living style to your home with the Waverly collection. The Waverly collection is a great option if you are looking for Contemporary furniture in the area. Browse other items in the Waverly collection from AHFA in the area.